Regular visitors will probably be surprised at this picture. Indeed, it is extremely rare that I make a close-up photo of a flower; “ too tacky” says a voice in my head. Nevertheless, this specimen was at home and over the course of several days I watched it grow, bloom, wither and die…so why not photograph it? 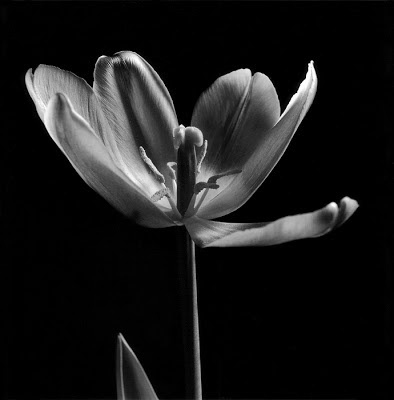 The tulip was at its most photogenic towards the end of its life, with one petal opened up, beckoning the viewer to enter. The light was diffuse daylight from a balcony door. The photo is actually not black and white as such, but the light tones are yellowish as can be seen in the final pictures below. I prefer a greyscale scan for the main photo, because of problems I encounter with colour scans and the variability of colours on different monitors. Even getting the greys right can be difficult! Over the last few months I’ve rediscovered the joys of selenium toning, mostly because I found that it can transform Ilford’s standard Multigrade fibre paper. Having used Agfa’s Multicontrast Classic and Forte’s Polywarmtone, both FB, for a long time, I always thought the tonal values of Ilford’s product lacked the kind of separation I was getting with those wonderful but unfortunately dead papers. Today, instead of showing a straight print, let me try to read the negative. I had placed a large piece of black cardboard behind the flower, rather clumsily it turned out. For a start, the cardboard edge appears in the lower left corner…bummer. More importantly, the light isn’t distributed evenly over the background: the left side of the neg is lighter than the right side, i.e. when the left side of the print is black, there’s a good chance that the right side will be a dark shade of grey. 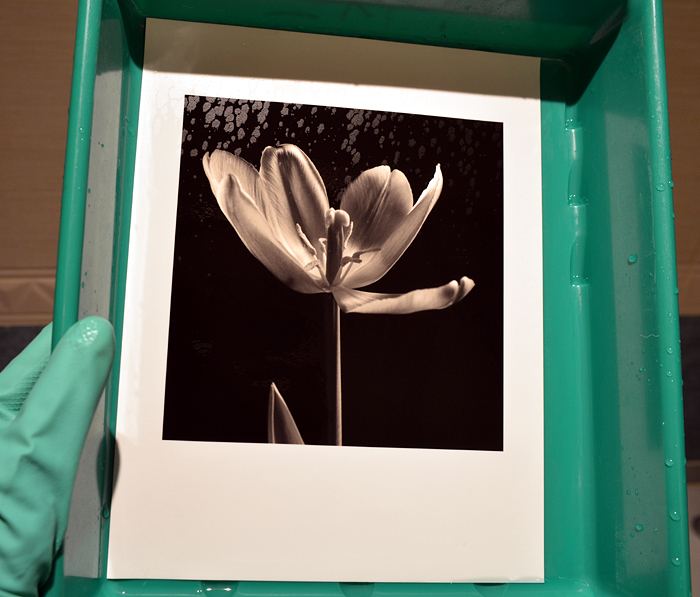 That’s eventually how things turned out in a print exposed for the flower petals. What I wanted, however, was a completely black background. 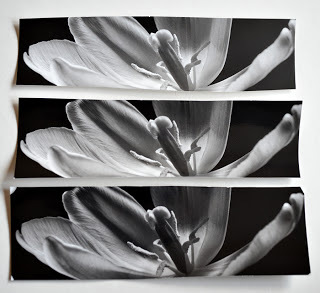 I made three test strips on fibre based Ilford Multigrade, using the grade 3 filter on my Meopta Meograde diffuser head. After quickly drying them in the microwave I decided on a base exposure of 14 seconds. With another set of test strips (not shown here), I decided that the background needed at least another 14 seconds at grade 5* in order to take it to pure black. 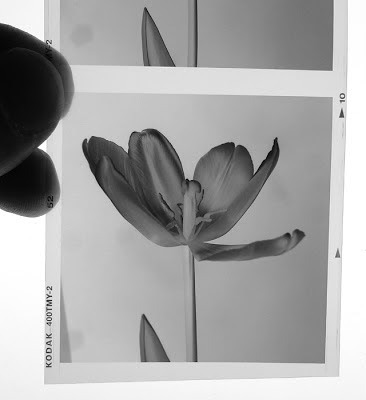 and use it to burn-in the background for the required 14 seconds by masking the flower, how would that turn out? I’m sure there are people out there who can manage just that without leaving any sign of the masking, but I’m not one of them. It’s really not that easy. 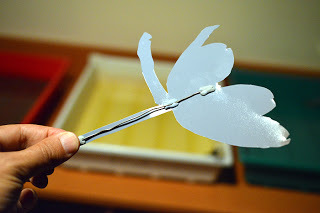 And don’t forget that it’s not only the petals but also the stem that has to look natural in the final print. One of my tactics for complex dodging and burning-in is to split them into smaller, more manageable pieces. That way, the human “errors” in every move become less perceptible. In this photograph, I divided the extra exposures into three separate steps. First, by holding the mask shown above very close to the paper I dodged the flower and leaf at the bottom left for 7 seconds. I hear you say that the mask placed flat on the leaf surely must leave a mark. If I had left the mask on the leaf for the whole 7 seconds, then yes, there would’ve been an obvious mark. But what I did was, I gave those 7 seconds as 7 x 1 second, and in each second I very slightly and randomly changed the position of the mask: again, dividing the problem into smaller parts. This method leaves no telltale sign of dodging. and with a similar mask held at a similar height I gave the left side of the photo the required additional 7 seconds. These masks were never held stationary, but were constantly moved around slightly. Also, you'll realise that at the top of the photo the exposures overlap. This is not a problem though, as this area is black anyway. Finally, to absolutely guarantee that the background is pitch black, I slowly moved a cut-out hole on cardboard around the edges. Now we’ve arrived at the interesting part (it's already been very interesting to me! - Ed). Since I wanted the petals to have a yellowish hue I gave the print a light sepia tone. What follows is rather important because how we proceed can yield dramatically different results. First, I’d like to give a very brief summary of sepia toning for the novice reader - are there any? (yeah, me, haha! No more "eds" from now on - Ed). I use a two bath sepia toner from Fotospeed. The first bath is called bleach and the second bath is the actual toner. Basically, the well washed print is first immersed in the bleach, where the image is gradually bleached back. Given enough time, it will disappear almost completely. After a thorough intermediate wash the print is transferred to the toner bath, where the image reappears, this time with the sepia tones. Depending on how we’ve prepared the toner bath, the tone can vary between bright yellow and dark brown. For this photo, I mixed the chemicals for a yellow tone. The twist with toning is how we use the bleach. For example, I don’t like a full sepia tone. I’d rather have only the light values pick up some yellow and leave the blacks unaffected. To get this effect, you’ll have to pull the print before the bleach starts to act on the darker tones. But if you dilute the bleach with water according to the instructions at a 1:3 ratio (that’s one part bleach to three parts water), you’ll be surprised what happens: the image starts to disappear the very instant the print touches the bleach! In other words, you lose all control; you just can’t be quick enough to remove the print at a desired bleach point. To regain some control at this stage I experimented with different dilutions and decided that 1:49 was just right for me! At such a high dilution ratio even after 90 seconds I can’t see any visible bleaching but once the print is transferred to the toner (after thorough washing) the light greys turn a slight yellow…just as I wanted. After sepia toning the print as described above, I put it through Kodak Rapid Selenium toner, at a 1:9 dilution ratio, for about 6 minutes. * check out the sentence in bold in my previous post that explains why. Well, another excellent article, very informative. 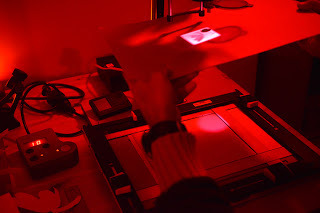 A detailed and clear explanation of dodging/burning process and also very interesting the part regarding the toners which I will try out on my next batch of prints. Again, thank you so much Omar and Bruce. 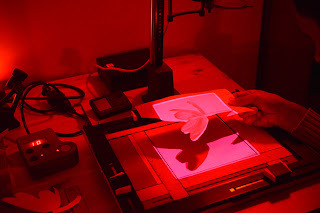 A very interesting blog Omar, you explain the steps you took so clearly, thank you for the article it has added enormously to my printing education. I am much obliged. Thanks also to Bruce for transmitting it. another great article on your process, thanks again! Thanks for this info. What's the effect of Selenium toning on its own? There's a bottle in the darkroom I share so I'm curious. I'm sure Omar will be along in a wee while but selenium on its own tends to make blacks blacker (increases d-max), gives contrast a slight boost and imparts a slightly coldish tone to the print. With warm-toned paper it can also give a brownish-plummy tone. You get different effects depending on the dilution as Omar points out. With some papers, selenium toning has very little effect. 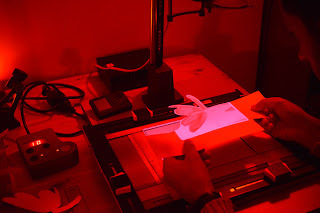 It also improves the permanency of the print by converting silver to silver selenide. Forgot to add that selenium is nasty stuff so you have to keep it off your skin and work only in a well-ventilated place or outside. Please read the health and safety guidelines on the bottle before using. I'm glad that some people found the post of interest. Nasir, with selenium you'll have to experiment a bit with the dilution to see the effects Bruce mentions. 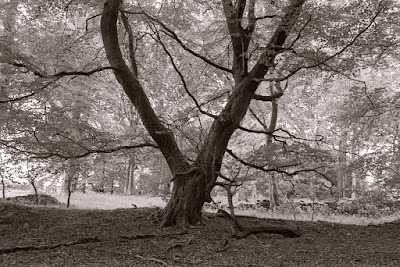 With Ilford MG for example, I can't see any affect at a dilution of 1:19 (I gave up after 15 minutes). But at 1:9 it's clearly visible after 5 minutes. It all depends on the paper type as well. Some papers take the toner with incredible speed and enthusiasm :) For example, the late Forte papers. 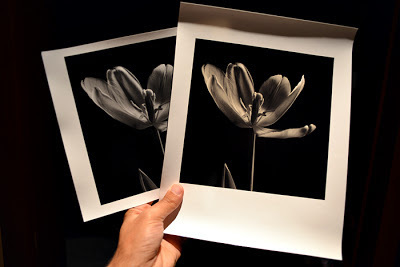 Selenium can also take off the slight 'green tinge' that you used to get with certain papers . . most notably the old Ilford Galerie. These days with selenium I get a solid definition to the blacks in Ilford Galerie, and a purple-ish tone to (especially) Kentmere and (not quite as much) Adox . . . It is a good thing to experiment with - I'll sometimes just use it for archival purposes, though you can sometimes be taken unaware and over-do the whole thing. Yet again an excellent article Omar and very nice print too! Sometimes the changes that selenium makes are too slow and slight to notice, as the eye becomes habituated. It's worth (at least once) preparing two identical prints, then putting one in a bath of water and the other in toner, under the same lighting. Look away frequently and you may be able to observe what's happening. The changes in print colour and tonality may be aesthetically significant, even though they're objectively very small. 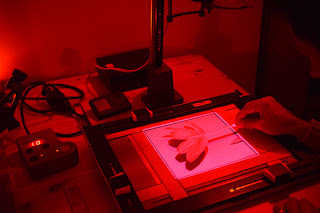 You can then use the knowledge gained for toning images on the same sort of paper. I have heard of people using selenium first, to "protect the blacks" and then using the toner, but I haven't tried it myself. The final effect may be different, of course. I 've only just got back into shooting film after too many years of missing the medium. I only came across your blog yesterday and just wanted to say how much I'm enjoying your posts. Thank you very much for posting such informative and interesting content.